Promoting the rule of law has become a major part of Western efforts to spread democracy and market economics around the world. Although programs to foster the rule of law abroad have mushroomed, well-grounded knowledge about what factors ensure success, and why, remains scarce. Promoting the rule of law has become a major part of Western efforts to spread democracy and market economics around the world. Although programs to foster the rule of law abroad have mushroomed, well-grounded knowledge about what factors ensure success, and why, remains scarce. 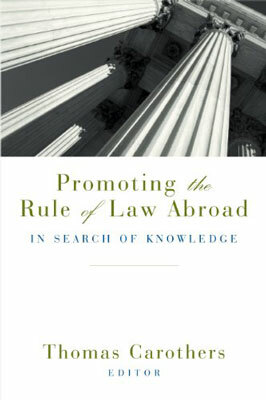 In Promoting the Rule of Law Abroad, leading practitioners and policy-oriented scholars draw on years of experience—in Russia, China, Latin America, Central and Eastern Europe, the Middle East, and Africa— to critically assess the rationale, methods, and goals of rule-of-law policies. These incisive, accessible essays offer vivid portrayals and penetrating analyses of the challenges that define this vital but often misunderstood field. Rachel Kleinfeld (Truman National Security Project), Lisa Bhansali (World Bank), Christina Biebesheimer (World Bank),Wade Channell, Stephen Golub, David Mednicoff (University of Massachusetts, Amherst), Laure-Hélène Piron (Overseas Development Institute), Matthew Spence (Truman National Security Project), Matthew Stephenson (Harvard Law School), and Frank Upham (NYU School of Law). Thomas Carothers is founder and director of the Democracy and Rule of Law Project at the Carnegie Endowment. He is a leading authority on democracy promotion and democratization worldwide as well as an expert on U.S. foreign policy.